Battle of the Inks – Project GREYscale! #inkitupfriday continues to present Inklimination on Instagram! WHAT?! A Giveaway where YOU decide which ink will be the prize?! YES! Without further ado… let’s meet the contestants! March and April are Project GREYscale and we will have eight inks challenge each other to be the Champion! These inks have gone through intense training and are ready to compete for your votes! We will have four Quarter-Final matches (March 9th, 16th, 23rd, 30th). The Final Four will compete in the Semi-Finals on April 6th and 13th. 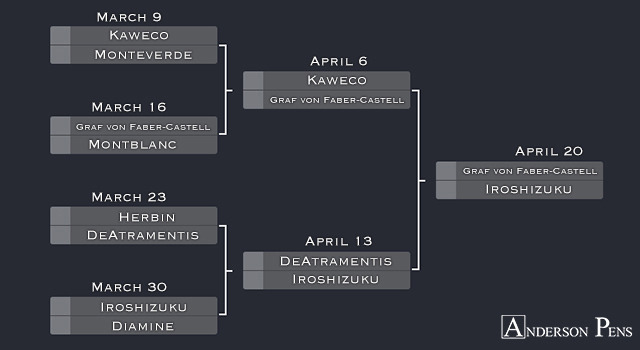 The Final Round will take place on April 20th, when YOU decide which ink will be the Champion! We have put together this handy dandy bracket to make things less confusing… or more confusing depending on perspective! A bottle of the Champion ink will be awarded to one lucky person who has voted during #inklimination – Project GREYscale! May the best ink win! 1. Vote on the Anderson Pens #inklimination Instagram Story… it’s easy peasy… you just tap the name of the ink you prefer! Voting ends: Twenty-four hours later, when the Instagram Story moves on to where all Instagram Stories go once they have fulfilled their duties… the Instagram Story Afterlife. The ink with the most votes will be announced by 1pm CDT the following Monday and move to the next round of #inklimination Project GREYscale! The lucky person to receive The Champion Ink will be selected at random between 10am CDT and 11am CDT on Monday, April 23rd and announced no later than noon CDT on Tuesday, April 24th. As with all good giveaways, this one is open to anyone and everyone, worldwide – but you need to be at least 13 years old and have an Instagram account. This entry was posted in Ink, Inklimination and tagged Inklimination. Bookmark the permalink.